Chelsea are through to the fifth round of the FA Cup after an emphatic 4-0 victory over Brentford. The Blues took the lead early in the first-half through Willian. The Brazilian curled a gorgeous free-kick over the wall and into the top-right corner of Dan Bentley’s net. You can watch his stunner here. 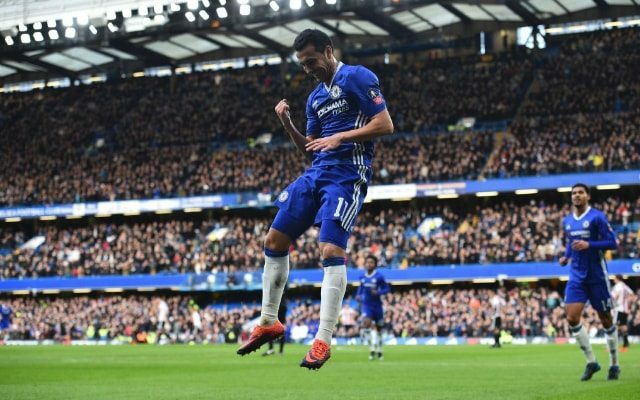 Pedro extended Chelsea’s advantage. The Spaniard raced through on goal and slipped the ball under Bentley to bag his seventh goal of the season in all competitions. Click here to see Pedro’s goal. Chelsea then added another through Branislav Ivanovic. The Serb overlapped Pedro down the right-hand side and fired home with a powerful drive to score what could be his last ever goal for the club. You can see Ivanovic’s goal here. Michy Batshuayi finally got his goal to round off the win. Ivanovic was fouled in the penalty area and the referee pointed to the spot. Batshuayi stepped up and made no mistake from 12-yards. Click here to see the Belgian’s emphatic penalty. Chelsea player ratings: Begovic 7, Zouma 7, Terry 6, Azpilicueta 7, Pedro 8, Fabregas 9, Chalobah 8, Ake 7, Willian 7, Batshuayi 6, Loftus-Cheek 8. Brentford player ratings: Bentley 5, Egan 6, Dean 4, Bjelland 5, Colin 6, Yennaris 6, McEachran 7, Woods 5, Barbet 4, Sawyers 6, Vibe 5. Man of the match – Cesc Fabregas: Fabregas was near-flawless today. Characteristically classy in possession, the Chelsea midfield looks so much more accomplished when the Spaniard is in it.